A 2-weeks-old wild rabbit was found and rescued by a loving family and nursed back to health with some warm milk and plenty of rest. But when the family cat gets involved, what happens next is an incredibly precious friendship you'll have to see to believe! FACTS: Male rabbits are called bucks; females are called does. An older term for an adult rabbit is coney, while rabbit once referred only to the young animals. Another term for a young rabbit is bunny, though this term is often applied informally (especially by children) to rabbits generally, especially domestic ones. More recently, the term kit or kitten has been used to refer to a young rabbit. A young hare is called a leveret; this term is sometimes informally applied to a young rabbit as well. A group of rabbits is known as a colony, or nest (and occasionally a warren, though this more commonly refers to where the rabbits live). A group of young rabbits is referred to as a litter, and a group of domestic rabbits is sometimes called a herd. 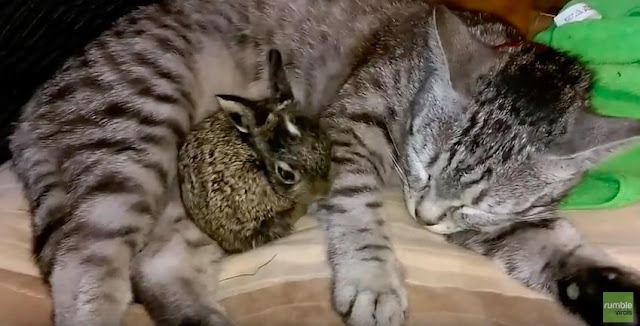 Responses to "Rescued bunny rabbit shares incredible bond with family cat "
"Mother rabbits only feed babies once a day, and then for only five minutes. They do not “sit” on the nest; in fact, they tend to stay away from the nest in order not to attract attention to it. Do not assume that the baby rabbits are orphaned just because you don’t see a mother rabbit nearby. Usually the mother rabbit only comes at dawn."